Fungal Nail Laser Treatment | Podiatry Associates, P.C. Laser Treatment for Fungal Infected Nails If you have a fungal infected toenail, there is a laser treatment that you should find out about. Watch this short video to learn more. Toenail fungus is unpleasant to say the least! It turns nails yellow, thick, crumbly, and deformed. It can even lift the nail from its bed causing debris to collect beneath it - not a pretty sight. 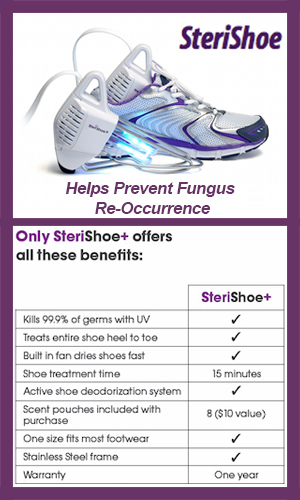 As if that isn't enough, the fungal infection can also emit an odor and make it painful to wear shoes. Worst of all, toenail fungus is stubborn -- once it takes hold, it doesn't want to leave! Over the counter topical medications typically have poor results. We can prescribe stronger topical, as well as oral, medications. However, our fungal nail laser treatment is the most efficient and effective way to get rid of toenail fungus and say bye-bye to the fungi! Our fungal nail laser uses a concentrated light beam that passes harmlessly through your nail to the fungal infection underneath, eliminating the problem at its source without damaging any surrounding tissues. The procedure is virtually painless, and is done safely right in our office. Treatments take less than 30 seconds and you can go right back to your normal activities, with no down time or side effects. 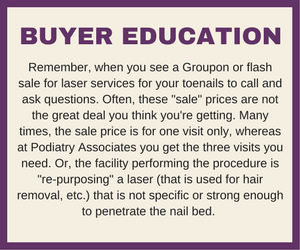 The number of sessions needed will depend upon the severity of your toenail fungus and the number of nails affected. Clear and healthy nail regrowth will be visible within a few months. Stay Away and Don’t Come Back! After you treat toenail fungus, you will need to take preventative measures to ensure the fungus doesn’t return. Keep feet clean and dry and sanitize pedicure tools between uses. Be sure to refrain from sharing towels, socks, or footwear. Remember, fungi thrive in warm, damp environments, so always wear shower shoes in public places like pool decks, saunas, and gym locker rooms and showers. Finally, treat your feet, as well as your shoes, with an anti-fungal spray or powder. When you come to us with fungal nails, we will assess your condition and determine if laser therapy is the right toenail fungus remedy for you. We will then discuss the treatment packages we provide to decide which option best fits your needs. You can use cash, credit, or your Health Savings Account or Medical IRA to cover the cost, as unfortunately, most insurance providers do not cover fungal nail laser treatment. Best Value. All 10 toes. Treatment of 1-5 toes on the same foot. Additional treatment for same location. 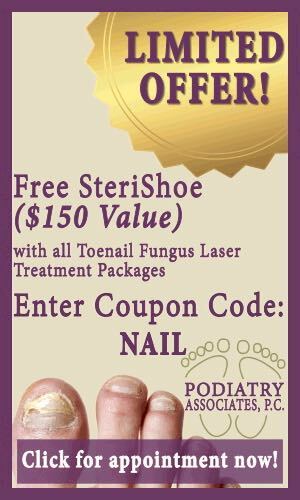 If you are struggling with toenail fungus, we can help you fight it and win! 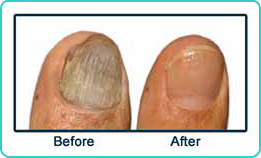 Zap the infection at its source with fungal nail laser treatment and say bye-bye to that fungi fast! Call (303) 805-5156 for an appointment today or use our convenient online contact form. We’ll help you get your clear, healthy nails back.